Portsmouth, R.I. (January 16, 2008) – Lightning World Champion Jeff Linton (Tampa, Fla.) and Princess Sofia Trophy Yngling Champion Sally Barkow Nashotah, Wis.) today were named, respectively, US SAILING’s 2007 Rolex Yachtsman and Yachtswoman of the Year. A shortlist of 10 male and nine female sailors—determined from nominations by the membership of US SAILING – were evaluated by a panel of sailing journalists who selected these two sailors for the noteworthy distinction. Established in 1961 by US SAILING and sponsored by Rolex Watch U.S.A. since 1980, the Rolex Yachtsman and Yachtswoman of the Year awards recognize the outstanding on-the-water competitive achievement of an individual man and woman in the calendar year just concluded. The winners will be honored and presented with specially engraved Rolex timepieces during a luncheon on February 29, 2008, at the New York Yacht Club in Manhattan. 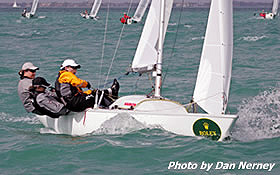 When Jeff Linton (Tampa, Fla.) received his first nomination for the Rolex Yachtsman of the Year award in 2005, it was the result of crewing aboard winning boats at the Etchells World Championship and the J/24 Midwinters, combined with a string of four top-five finishes in the Lightning class. Fast forward two years to find the 45-year-old Linton now semi-retired, having sold his partnership interest in Masthead Enterprises, and in the helmsman’s position, dominating the Lightning class, for which he has been crowned the 2007 Rolex Yachtsman of the Year. 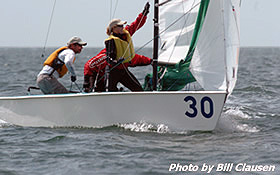 Linton won the 2007 Lightning World Championship in Athens, Greece, in a fleet of 48 with 11 nations represented, but he noted that the hardest event to win in 2007 was the Lightning Winter Championship, which has no restrictions on the number of entries. At that 71-boat event, contested in St. Petersburg, Fla., he edged out numerous notable sailors to win by just one point. His success in the class also included: the South American Championship held in Bogota, Columbia, where first-place finishes in three races ultimately gave him a 14-point win over the 20-boat field; the title win at the Florida District Championship; a second-place finish at the Lightning Deep South Regatta in Savannah, Ga.; and second overall in the Lightning Southern Circuit out of 42 boats. Linton also earned additional praise from the selection committee for performance in two other competitive one-design classes: he won the Flying Scot North American Championship and the Classic Moth National Championship. honor in 2005, Barkow was nominated to the shortlist for the sixth consecutive year and now joins a select group of women who have received the accolade more than once. Although Barkow’s primary focus has been helming her Yngling with a goal of representing the U.S.A. at the 2008 Olympic Games in China, her performance in other classes, whether fleet or match racing, were what set her apart in 2007. Barkow started the year with her third consecutive win of the Rolex Miami OCR in the Yngling class. On task in the Yngling, she finished second at the North American Championship in Miami, won the Princess Sofia Trophy in Spain and collected silver at both Semaine Olympique Française in France and the ISAF Sailing World Championships in Portugal. Barkow’s turn on the match racing circuit was highlighted by wins at the Boat U.S. Santa Maria Cup in Annapolis, Maryland102, and the Vitória Brasil Women’s Cup in Brazil. Flying straight from Brazil to Houston, Texas, Barkow took the helm of a J/22 to close the year as she had started it—collecting another championship title for the third consecutive time. She won US SAILING’s Rolex International Women’s Keelboat Championship (IWKC) without having to sail the final race of the series after topping a field that included past winner and fellow Rolex Yachtswoman of the Year (’95, ’01) Cory Sertl (Rochester, N.Y.), as well as Anna Tunnicliffe (Plantation, Fla.) who will represent the U.S.A. at the 2008 Olympic Games in the Laser Radial event. Only one other woman has won the Rolex IWKC multiple times: Betsy Alison (Newport, R.I.) has won not only the regatta but also the Rolex Yachtswoman of the Year award a record-setting five times. The 27-year-old Barkow grew up in a sailing family and started receiving national recognition as two-time ICSA (Inter-Collegiate Sailing Association) All-American (2001 and 2002) while studying Psychology at Old Dominion University (Norfolk, Va.). Since graduating from ODU, her single-minded focus has been her goal of competing at the Olympics in the Yngling class. The linchpin to that quest will be the Yngling World Championship in February which will be the final event in a series that will determine if Barkow’s team represents the U.S.A. at the 2008 Olympic Games in China. Since Rolex Watch U.S.A. first presented timepieces to America's Cup defenders in 1958, the company has consistently recognized and encouraged excellence in every important arena of competitive sailing, including US Sailing Team preparation, US SAILING championships, disabled sailing, offshore, one-design and women's events. The United States Sailing Association (US SAILING) is the national governing body for sailing. Founded in 1897 and headquartered in Portsmouth, Rhode Island, the organization provides leadership for the sport of sailing in the United States. US SAILING offers training and education programs for instructors and race officials, supports a wide range of sailing organizations and communities, issues offshore rating certificates, and provides administration and oversight of competitive sailing across the country, including National Championships and the U.S. Olympic and Paralympic Sailing Teams. For more information, please visit www.ussailing.org.